Ducks Drill Down: Back on Track? 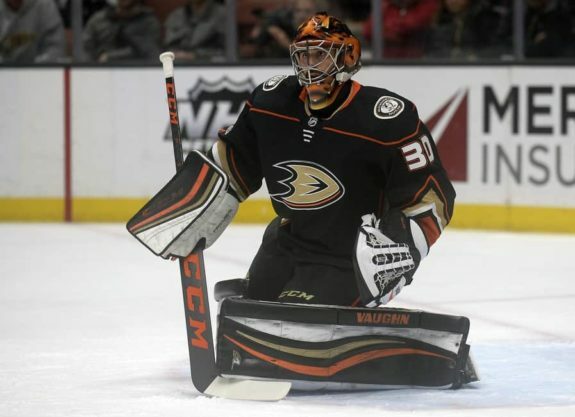 ‘Ducks Drill Down’ is a regular, ~weekly column that recaps the latest goings-on with the Anaheim Ducks. Last week, they were out. Now, they’re back in. So it goes in this up-and-down season for the Anaheim Ducks. Now, though, with three straight wins, capped by a gutsy shutout victory against the league-leading Vegas Golden Knights, perhaps there is reason for increased optimism. The Ducks’ road trip that started last week might have ended well, but it did not start out that way. Following a painful 3-2 overtime loss to the San Jose Sharks at home on Feb. 11, the Ducks were unable to get the bounce-back result they were looking for in Detroit last Tuesday night against a mediocre-at-best Red Wings team. It was the Ducks’ first game in the new Little Caesars Arena, but they did not come away with their first win there. The Wings edged the Ducks, 2-1, despite managing only 16 shots on goaltender John Gibson. Meanwhile, Anaheim more than doubled Detroit’s shot total with 33, but Jimmy Howard was up to the task in turning aside all of them except for a rebound tap-in by Adam Henrique with under four minutes to go. Well, that and two other shots that went in but were called back for a blown whistle on one and goalie interference (everyone’s favorite rule because of its great lack of clarity) against Nick Ritchie on the other. Getzlaf and the Ducks continued to voice their dissatisfaction with their overall game, even in spite of the decisive advantage in shots and all-situations possession. Fortunately for the Ducks, they would get back on the winning track in their next two contests against Central Division opponents in the Chicago Blackhawks and the Minnesota Wild, the latter of whom is very relevant to the Ducks in terms of wild-card positioning. The hockey gods would shine more kindly upon the Ducks when they took on the disappointing Blackhawks, losers of seven in a row coming in. Unlike the game in Detroit, it was the Ducks who were outshot and out-possessed by the Hawks, as the home team peppered John Gibson with 44 shots while the Ducks managed 32. The overall Corsi numbers were quite lopsided in favor of Chicago (82-43), but power plays and an empty-net desperation attack from the Hawks and contributed a lot to that, as the 5-on-5 numbers were a bit more respectable for Anaheim (46-40 for Chicago). 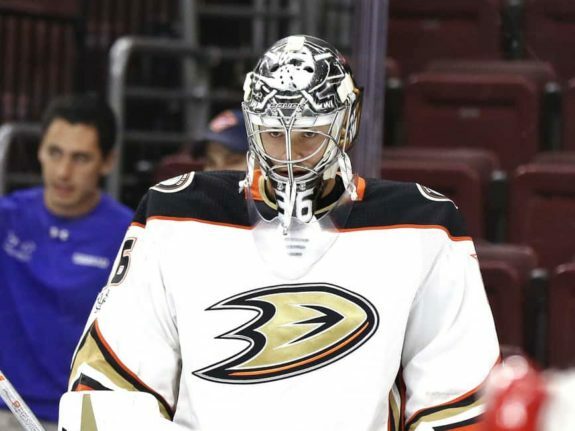 As has been the story for much of the season, Gibson gave the Ducks a chance with his 42 saves. They fell behind 2-0 in the second period before bouncing back to tie it in that same frame on a rare goal by Nick Ritchie and a not-rare goal by Ondrej Kase. In the third, Adam Henrique put the Ducks ahead for good when he flipped in a backhander from the slot. His goal completed the hat trick for the third line as a whole, as each member of Anaheim’s new offensive weapon found the back of the net. The Ducks withstood a furious rally from the Blackhawks, with Gibson making a spectacular save on Brandon Saad in the waning moments. The Ducks then made a short trip to Minnesota to take on the Wild in a Saturday matinee game that had serious implications on playoff positioning. The game was a tight affair, with the Wild taking a 2-1 lead into the third period before the Ducks once again came from behind thanks to yet another tying goal from Kase. Anaheim stepped up its game in the third period with a strong push, generating 14 shots on goal after getting just 16 in the first two periods. They were able to get the game to overtime and then a shootout, and contrary to how most of their extra-session games have gone this season, they were able to get the job done in a tense 11-round shootout. Gibson was spectacular again, and a perhaps-awakened Ritchie sealed the deal with the shootout winner. The Ducks’ new(ish) third line of Henrique, Ritchie, and Kase has been dynamite lately and, along with Gibson, is one of the main reasons the team was able to get critical wins in Chicago and Minnesota. In the two victories, Henrique and Ritchie each picked up three points (one goal and two assists each), Ritchie added a shootout winner, and Kase had four points (two game-tying goals and two assists). Behind top producers like Ryan Getzlaf and Rickard Rakell, this type of secondary (or really, additional primary) scoring could be the key factor that propels Anaheim to the playoffs. The Ducks’ final game of the trip took them to Vegas on the way back west. The Golden Knights own the NHL’s best record and had already beaten Anaheim three times this season. Given that, a loss seemed to be, ahem..in the cards for the Ducks. But they would not let the house win this time. In one of their best team efforts of the year—particularly from a defensive standpoint—the Ducks stifled the Golden Knights’ high-powered attack and got goals from Jakob Silfverberg (his first since Jan. 30) and Josh Manson (his first since Nov. 22—against Vegas) en route to a huge 2-0 win. The Ducks might have been outshot 33-20, but they shut down Vegas for most of the game, with the Knights getting a large chunk of their chances late in the third as they tried to stage a rally. Gibson and Ryan Miller combined for the 33-save shutout. Miller had to relieve Gibson after the second period after Gibson got clipped with just a few seconds left in the frame. More on that later. Miller came in and did his job, turning away the Knights’ comeback attempt with 20 saves. Head coach Randy Carlyle was happy with his team’s effort and result and even took what seemed to be a very subtle, veiled jab at the officiating. The Ducks have seen a few notable lineup shifts over the past week. 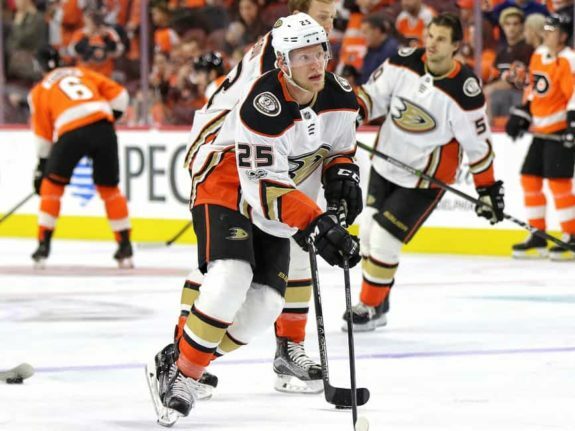 In addition to creating a more well-rounded attack up front thanks to the Henrique-Ritchie-Kase trio, the Ducks are tinkering with their back end to see what improvements can be made there. In the win over the Blackhawks, recently called-up defenseman Marcus Pettersson made his NHL debut. He joined the lineup in place of the aging and ineffective Kevin Bieksa and stayed in against Minnesota and Vegas, with Francois Beauchemin being scratched in those latter two games. Pettersson, a 21-year-old Swedish prospect Anaheim selected in the second round of the 2014 draft, is mostly a stay-at-home defender who relies on solid positioning and efficient puck movement. At 6-foot-4 and 180 pounds, he has some size and room to bulk up a bit, but he is nevertheless a reasonably mobile player. In 44 games with the AHL’s San Diego Gulls this season, he did not find the back of the net but did pick up 14 assists—a sign of his passing ability that complements his defensively-oriented nature. Pettersson saw 13:38 of ice time against Chicago, 11:46 against Minnesota, and 10:53 against Vegas as Carlyle tries to ease him in and not put him out there in too many critical moments late in games—yet. Pettersson played mainly with Josh Manson and also saw some time on the penalty kill. With trade deadline activity possibly being nonexistent, the addition of Pettersson from within could help Anaheim shore up a blue line that was once a strength but has been shaky this season. While Pettersson is a new addition to the lineup, Ryan Kesler was a subtraction against the Wild because of a lower-body injury. Kesler, who missed significant time to start the year as he recovered from offseason hip surgery, did return to the lineup Monday night in Vegas. Nevertheless, it’s a situation to monitor closely given how clearly Kesler has been laboring through each game since his return. A situation to monitor even more closely in the short-term is Gibson’s aforementioned injury. With just a few seconds remaining in the second period in Vegas, the Golden Knights’ Reilly Smith skated behind the net as Gibson had come out to play the puck. Smith’s skate clipped Gibson’s, causing the goaltender to fall awkwardly. While he did not exit the game immediately, he skated off gingerly at the end of the period and did not return for the third. This is not the first time this season that there has been this type of injury scare with Gibson, so the hope is that, like those other instances, it’s nothing too serious and that he will miss little if any additional time. With their three consecutive victories, the Ducks sit in third place in the Pacific Division with 71 points through 61 games. The lead the Los Angeles Kings by two points, though LA has two games in hand. They are also within one point of second-place San Jose, which also has two games in hand. Then there are the wild-card positions, currently being held by the St. Louis Blues (72 points in 60 games) and the Wild (71 points in 59 games). The Ducks will try to solidify their positioning when they return to Honda Center for their first game of the season against the Dallas Stars, who, with 72 points and barely holding on to third place in the Central Division, could also be involved in the wild-card picture. Anaheim will then travel to Arizona to take on the last-place Coyotes Saturday at 5:00 p.m. PST before coming back home to face off against the Edmonton Oilers Sunday evening.